Here is a bit about us, we carry only the best avian products available to help ensure your birds stay healthy and happy. We offer only the best advice and personal one on one customer service to ensure that you and your feathered family are happy and healthy! Our customers talk about us often, we have over thirty-four years of experience in the avian field and have a certified avian specialist on staff to answer all of your feathered questions! Founded in 1989, we have over twenty eight years in business, specializing in our Avian friends as well as many aspects of pet supplies and toys for dogs, cats, wild birds and small animals. Renee has over fourty-four years of experience in the avian field. As a child, her family had over one-hundred birds in the family aviary. 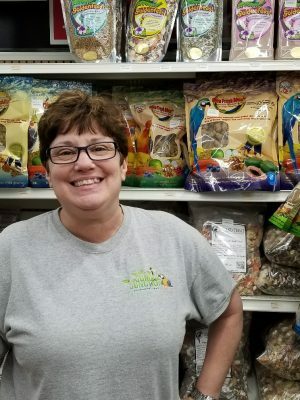 She opened Jungle Junction over 28-years ago and has since become a certified avian specialist, so she can help suggest products that will keep your pets healthy and happy. Renee Ducharme C.A.S. founded Jungle Junction in June 1989 after having been in the pet industry training birds for family and friends after having over 100 birds in the family aviary at the young age of 10 years old. She moved her passion and expertise into helping her customers have access to the best products and supplies available. She has been sought out by many people in the industry for her expert opinion and her vast knowledge of our feathered friends, from manufacturers of nutritional products to cage & play-stand designers as well as senior level sales executives inquiring and learning about what intrigues and keep our feathered friends happy and healthy. Renee has also provided key insight to major companies in providing details in helping to develop products that have been developed and are available to the consumer market today. Barbara Erickson has been in the pet industry for over six years and in the customer service industry for over 15 years. Her experience with pets varies from feathered friends to our four legged furry pals and she is able to provide all of her customers a unique experience which will exceed all of your expectations and needs. Her life long love of pets gives her a hands on perspective for offering suggestions and solutions to help your animal family members thrive. Come visit her here at Jungle Junction to experience the customer service difference. Walter Ducharme has been in the retail and customer service industry for over 25 years. His expertise in merchandising and internet sales provides a unique customer experience which will exceed all of your expectations and needs. Since 1999, his passion for birds has developed and continues to grow as he is exposed to daily feathered friends and continued exposure to loving interactions. Contact him for all your necessary requirements. Nicolette Ducharme has been exposed to many different aspects of the pet industry, including products, products recommendations, bird training, bird maintenance & care, and various pet ownership experiences. Her experience in customer service and sales, as taught by her mother is unmatched in the retail industry locally. She is an expert in her ability to process sales in the checkout area.